The words "journalist" and "amateur video maker" describe best what Luduc is. This peculiar character is only getting some fame since August 2011. 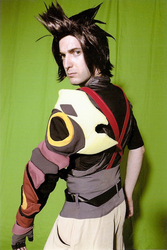 He is now known for his comedic vignettes about cosplay and the various conventions he happened to attend. For a year now, he has the places most sought by otaku, geeks and others, sharing in their passions. Be careful! You may very well be featured in his next video. Luduc is also known for two other Web series, Les Graphistes and Lucboy.